Capone is a visual retelling of the rise and eventual fall of Chicago's most notorious gangster: Alphonse “Scarface” Capone. 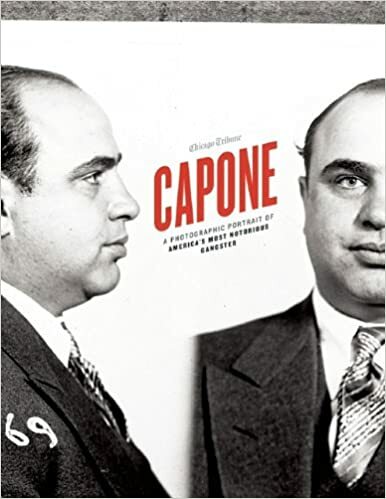 Comprised of many previously unreleased photographs from the Chicago Tribune's vast archives, Capone reveals the Roaring Twenties and the early days of organized crime. Taken from 1926 to 1952, these photos focus on Capone and his extended network of family, friends, and enemies. All the photos — high-quality scans of original glass-plate negatives — are historically significant for both those interested in Capone and photography buffs in general. The first section covers Al Capone's luxurious and illicit gangster lifestyle, including vacation homes, mob funerals, and gun-toting arrests up to and including the Saint Valentine's Day Massacre of 1929. Part two documents Capone's 1931 arrest, trial, and sentencing on charges of defrauding the government. The third section introduces a mob target who evaded assassination for decades, and another who wasn't so lucky. Part four follows up with Al Capone's brother, Ralph, and the final section focuses on Capone's death.